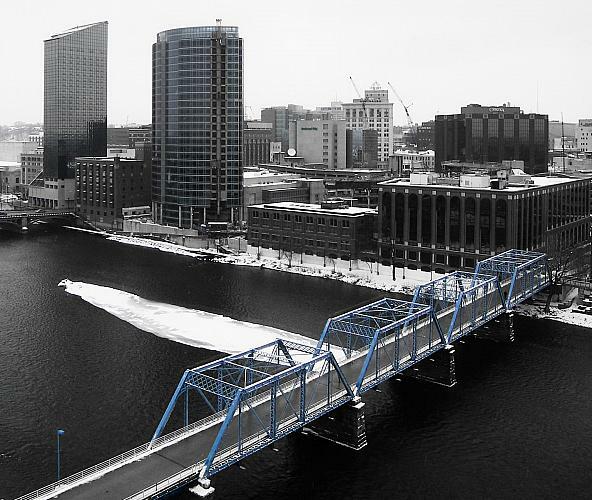 The photo, looking east over the Grand River, highlights the Blue Footbridge, formerly the Grand Rapids & Indiana Railroad bridge. The original railroad bridge was built in 1868; its replacement, built in 1874, was destroyed in 1883 during the great log jam. The current bridge, the oldest railroad bridge in the city, was built in 1892. Trains crossing this bridge traveled between Muskegon and Mackinaw City. When rail traffic ceased in the 1980s, the span was restored, painted its distinctive blue color, and became a pedestrian walkway across the Grand River known as the Blue Bridge. The bridge ends on the east bank at a walkway that leads to Campau Ave.; it leads to the Eberhard Center of Grand Valley State University on the west bank. The two tallest building are hotels: the Amway Grand Plaza on the left, and the Marriott to its right. The tall building near the center (between two cranes) is the McKay Tower at the corner of Monroe Center and Pearl Street, or as known locally, Campau Square.